My exact thought as I succumbed to the garlicky lure and opened the oven to peek, with 4 minutes and 43 seconds to go until I could pull this white bean pesto pasta bake from the oven and…photograph it. Ahhh, the weird life of a food blogger. It all worked out this time, though, since Steve was working late and had to drive back from New Jersey. As I heard the familiar, ummm, choke, of the garage door opening, I was wrapping up my shoot in unusually perfect timing. Little did we know, of course, that 16 hours later we’d be parked in the ER, eating a bag of chips and waiting for X-rays. That said, you KNOW I’m going to take this brief opportunity to get all sentimental and remind you to appreciate every family dinner, no matter how crazy your house may be or what you’re sitting down to eat! 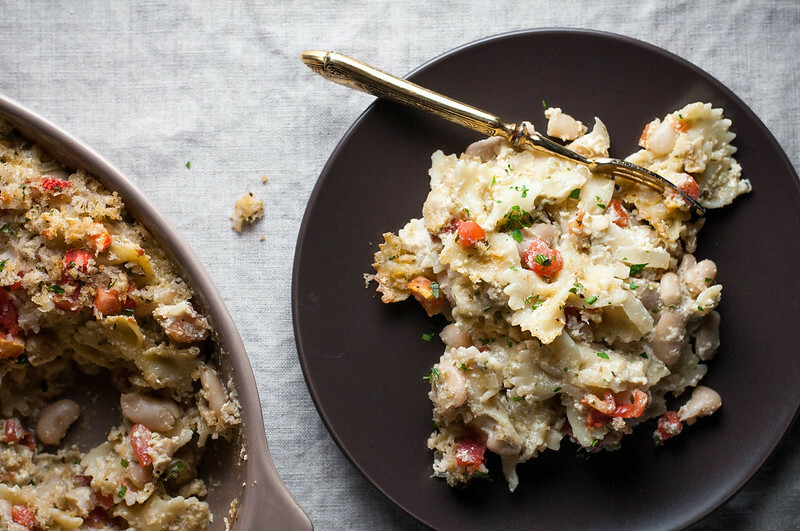 If, however, you decide to sit down to white bean pesto pasta bake, there are a couple things you should know. First, it’s awesome, because you get everything about pasta that you love, but there’s only about two cups of cooked noodles in a whole six serving dish. It’s definitely not gluten free, but by bulking up the volume with beans, you can even afford to have seconds and still keep your pasta consumption in check. Second, I really wanted this thing to be green and colorful, but I hate wasting food, and I had a tub of not-so-colorful garlic scape pesto in my freezer (scapes are not as bright as basil). 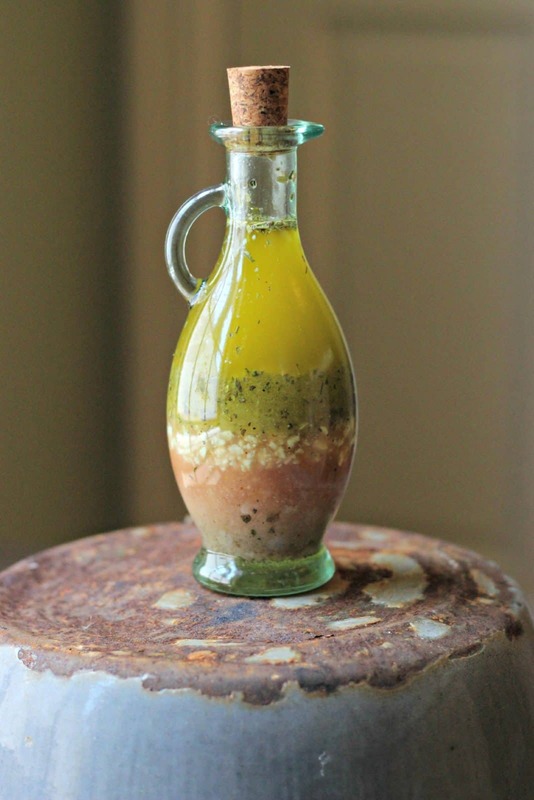 We’re a bit out of the woods on scape season, but if you’re interested in the super punchy pesto recipe and don’t care if your food is going to win a beauty pageant, the recipe is in my free eBook. As always, Lindsay, master of colorful-beautiful-delicious food, achieved what I missed in aesthetics. 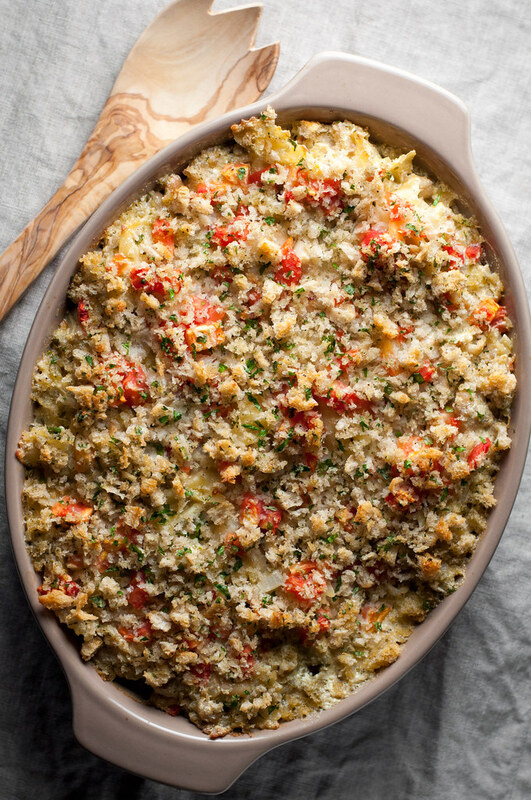 What would be really awesome is to combine her healthy pesto with this here pesto pasta bake recipe for a colorful, meatless pasta bake extraordinaire. First one to try it wins my sincere admiration! Seriously, though, go with your favorite pesto according to taste, whether it’s made of greens, basil, garlic scapes, or sun dried tomatoes. 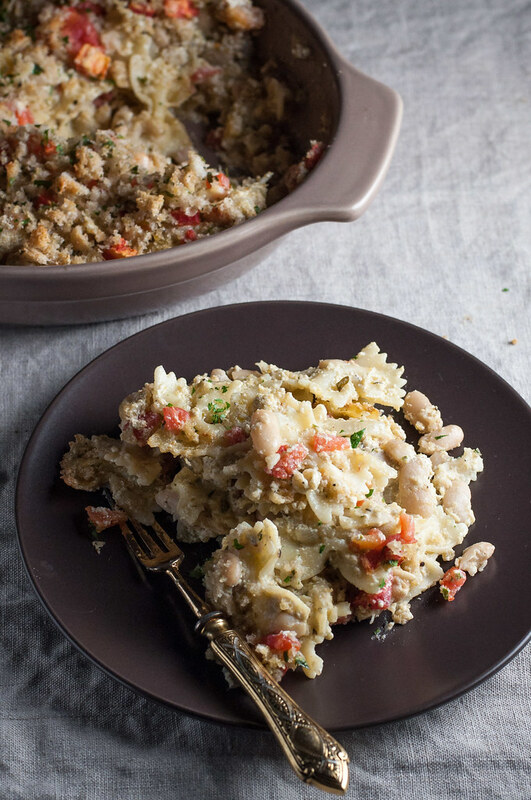 All of the above would be perfect complements to creamy, warm, mellow ricotta cheese and a little pop of juicy diced tomatoes that you’ll find smothering beans and pasta in this sort of Italian, grown up twist on mac and cheese. And yeah, it was not any part of a theme or plan to hit four consecutive Italian themed recipes on the blog, but it’s happening anyway. Maybe while I was in Minnesota I missed my usual frequent dose of pizza, pasta, or red sauce in some form or another? This late summer/early fall time is the perfect season for it, though, with all the eggplant, tomatoes, zucchini, and fresh herbs soon to head into winter hibernation. 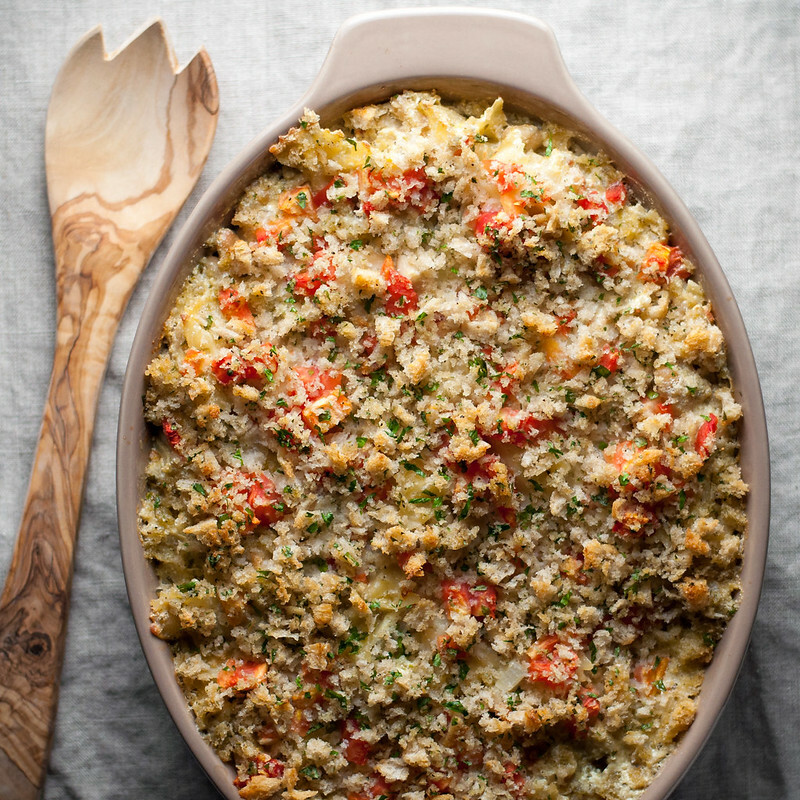 As weird as it sounds, this pesto pasta bake is actually part of my gratin series. You know, the one where I’m cooking my way through the Gratin chapter of Deborah Madison’s indispensible vegetarian cookbook? 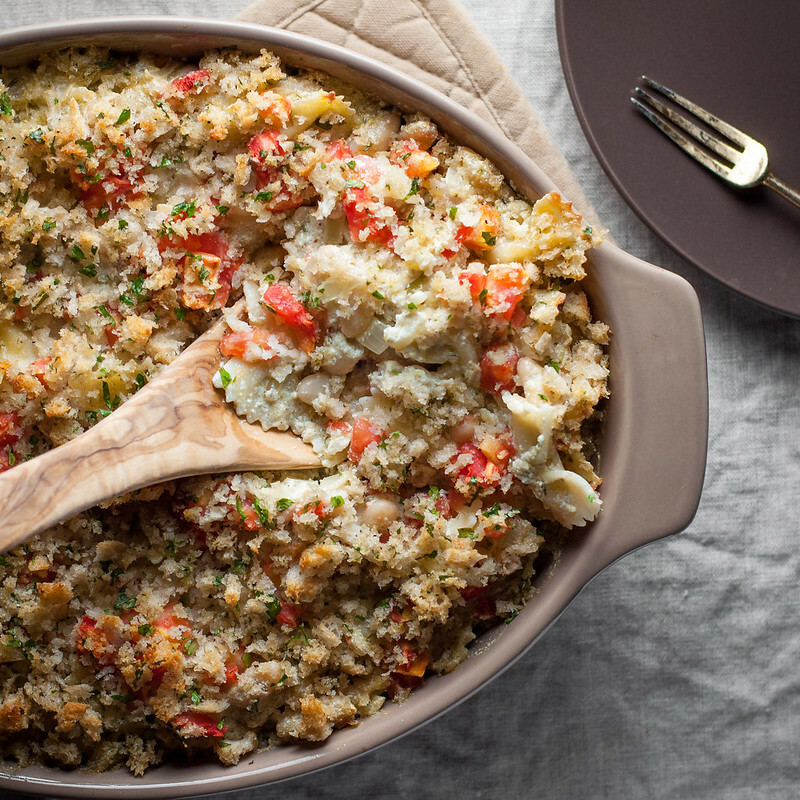 Really, when you think about it (which I previously hadn’t), the gratin is the basis for most of what I claim as natively midwestern hot dishes: any noodle, veg, or rice, mixed with cream or cheese or bread and baked to hot and bubbly perfection. Thank you French? 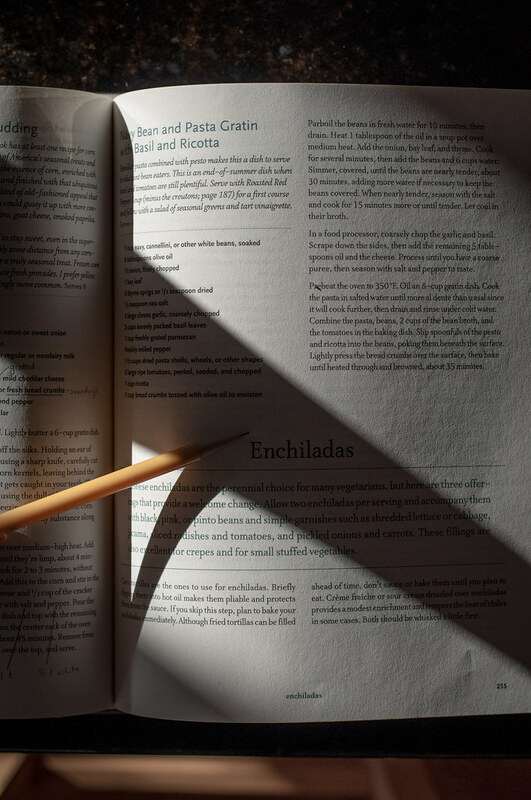 This might be a stretch, but Madison actually includes a few enchilada recipes in her Gratin chapter, and needless to say, I am PUMPED that we’re arriving at that section. Enchiladas are my spirit food, if that’s a thing. I’m counting down the days until Steve and I leave for Dallas, for a week of enchilada eating, margarita drinking, and football watching. My brother-in-law has so graciously welcomed us northerners into his fun southern OU football tradition, and I’m proud to sport my Sooner gear any time I’m south of Iowa (Christmas hint: I don’t have enough OU gear!). I’m still processing all that I learned at the Pinch of Yum photography workshop and exploring my co-participants’ blogs. Today I’ve been totally flabergasted by the beauty that is Julie’s blog, The Gourmet RD. Yep, another RD on hand at the workshop. Over that weekend, we all had a blast learning and practicing, but we didn’t get much chance, if any, to explore each other’s work. I couldn’t tell you exactly who’s been blogging for how long, but now that I’m home I’ll head over to someone’s site, such as Julie’s, and be like, “Why didn’t I know they were so talented?? ?” You have to see her photography for yourself, but here’s just a snippet, because…feta vinaigrette??!! Um, hi, where has this dressing been all my life. Cannot wait to try this stuff. After finally coming home from our eventful ER visit last weekend, I could not have been happier to meet half a pan of leftover bean and pesto pasta bake, and I think Steve, in his broken state, felt the same way, only more. Five days later, we’ve managed to maneuver a shirt onto him twice without further fracturing his clavicle. As I write this, I’m watching him in a painkiller-induced snooze (awwwwwww) as the living room floods with perfect golden sunset light, kind of dreading tomorrow morning when the prescription meds are up and we switch over to ibuprofen only. I mean, they will be large doses, but I think we’re both ready for the pain to get a little worse. It’s interesting timing, giving us a glimpse into the ups and downs we’ll weather together for the rest of our life, as our wedding date very quickly approaches! Pasta with chicken is all the rage, but what about pasta with beans for a meatless take? Cannellini beans have lots of protein to fill you up and provide volume in the serving dish, cutting down on the gluten, with just enough pasta to be a treat. Bring a medium pot of water to a boil, then add about a teaspoon of kosher salt. Stir in pasta and cook quite al dente (mine required about 8½ minutes for regular bowtie pasta)--the noodles will soften a bit more in the oven. Drain and rinse with cold water; set aside. Heat 1 tablespoon oil in a large skillet or Dutch oven over medium. Add onion, bay leaf, and thyme and sauté until onion is softened. Reduce heat to low and add ricotta, pesto, and stock. Stir to combine into a smooth sauce, then fold in cooked pasta, beans, and all but a handful of the tomato to coat. Taste and season with salt and pepper as needed. Turn off heat. Lightly oil a 2 quart baking dish and transfer pasta and bean mixture to it. Sprinkle the top with remaining tomatoes. Toss breadcrumbs with a pinch of salt and pepper, some chopped herbs if you have them around, and about ½ tablespoon oil. Sprinkle evenly over the dish. Bake just above the middle rack for 35 to 40 minutes, until the breadcrumbs start to brown in a few places. Serve warm, alone or with fresh herbs. 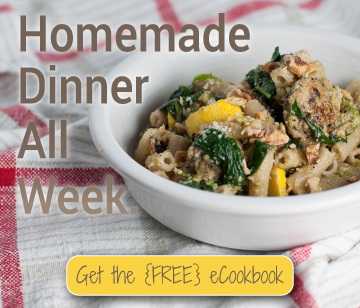 Adapted from Deborah Madison's navy bean and pasta gratin with basil and ricotta. No good fresh tomatoes around? Substitute canned diced tomatoes, just drain them first. If using vegetarian pesto and ricotta, the dish is vegetarian. It's 100% meatless, no matter which cheese you use!